You need to… Master ALL Media. They spent 69% of their advertising spend in 2016 on… TV. And that is not counting other media like direct mail, print media and radio. Either way, they are circumventing their own media for good reason, the other media works better and they know it. Google increased it’s spend on TV advertising from $180 million to $260 million putting more than 74% of its ad spend into TV. Facebook had a 260% increase year to year. Combined, they spent $813 million of the $1.18 billion dollars they spent on advertising on TV. So, their offline spend is massive and their online spend is peanuts. Facts are facts. The numbers don’t lie. They are doing LEAD GENERATION! If you want to survive and thrive in business today, it’s imperative you have a range of affordable, predictable, reliable, profitable… MEDIA to EXPOSE your MESSAGE to the market. In no particular order, I am going to list a range of media that could, when applied correctly, blow your profits through the roof. It never stopped working in spite of Google and everything else you can think of. In fact, it’s working better today than it ever did! I myself and many of my clients consider ourselves lucky enough to be able to utilize Direct Mail with incredible results. And we are doing it NOW in this economy when the cost of mailing is up and fortunately for us, the letterbox is largely empty. 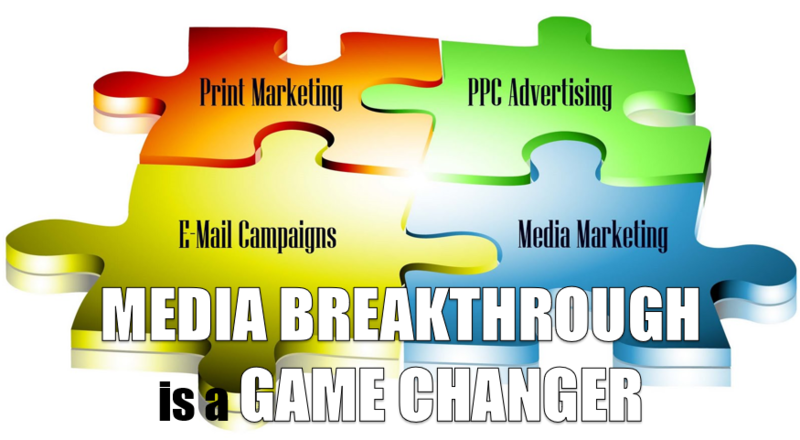 DIRECT MAIL is a GAME CHANGER… The idea of turning paper and ink into MONEY is a GAME CHANGER! Direct Mail is the success strategy for a business world turned upside down. We love the fact that competitors, or would be competitors, think Direct Mail is too expensive or doesn’t work anymore or the fact that they don’t know how to do it correctly. (hence it doesn’t work because they are clueless). I am talking about time tested, proven, direct response mail that follows a strict formula. Rule #3: There must be clear instructions on how to respond. Rule #4: You must give them multiple means of responding. Rule #5: You must always use a bold headline. Rule #6: You must always follow the emotional direct response model. Rule #10: You must always use testimonials or case studies. Rule #11: You must never use “Mr. Professional” jargon. By the way, this formula works in any media, not just Direct Mail. Your list is the keys to the money vault. Well I know of companies in the U.S turning over millions of dollars a month and a year using Print Media. Of course, in the U.S you have economies of scale, millions of publications a week, make all that possible. Because you can buy the media for a fraction of what they would prefer to charge, if you know how. To a lesser extent, that happens here in Australia also, except it is the big advertisers like Harvey Norman, Myers and David Jones that get the deals. Is Print Media right for everybody? No… it depends where your target market shows up most. But here in an interesting stat… 70% of readers of Print Media are over 45. So, if that is your target market and you are not using print, you are completely neglecting a large portion of your prospects by not using Print Media. Another fact, Print Media is more trusted by the reader than any other media, particularly the online media. Another fact, Print Media clients make better clients and spend more as well as stay longer. Why? I suspect they most often pay for the publication they are reading, so they are more qualified. Of course, again, there is an art to all of this and I won’t be sharing it here, I’ll leave that for another Rant. But what doesn’t work like they used to is the Business Card type Ad, name, rank, serial number and “come buy from me for no special reason”, you have to be better than that! Again, there is a right way and a wrong way to do radio. And of course, if your ideal client is listening to radio, you shouldn’t be neglecting it. The best performing media for radio is talk back. And it usually takes 60 seconds to get your message across. Anyway, I will cut to the chase and actually show you a radio ad that worked like crazy all around the country for me. Anyway, in another Rant, I will teach you exactly how this is done. Already this Rant is getting way too long! To be honest, if you are not using Mobile SMS Marketing, you are crazy! You are also crazy if you are not figuring out how to get your client’s mobile numbers so you can market to them. After all, something like 90% of SMS messages are read within 1 minute of being delivered… I don’t know any media that has a statistic like that! And literally everybody has a mobile phone! Anyway, here is a sample SMS that brought in approximately $63,000 in sales the first time it was sent to my client’s database and the good news is, it is still being sent out to this day several years later. Point being, once you get a marketing piece like an SMS working, keep sending it out in a timely manner. Here is another example. The product is pizza’s but you could easily replace that with your product or service. Note! This promotion was over a period of 1 month and there is a set of 3 sequential emails to be sent out on the 7th, 14th and 21st of the month. For a start, you should try and keep your SMS to under 160 characters (including spaces) because that is the maximum number of characters a standard text message allows. You can go over that number, but you will pay more money to do so, the rate of 2 standard messages. Something else you need to understand and this is good news, there is very few industries that couldn’t benefit from using mobile marketing, here are some more statistics that prove that. Here is the response rate to various industries within the first 15 minutes of them being sent. And that research was based on over 1 Billion SMS’s being sent in various countries. A bunch of Media Breakthroughs that you should be figuring out if you can use some or all in your business.